Usedom is an island in the Baltic Sea; situated close to the Eastern-most border of Germany, since 1945 the island has been split between Germany and Poland. And since 1994 the island has hosted the Usedom Music Festival. This year the festival runs from 24 September to 14 October 2016. The festival celebrates Baltic musical cultures, and each year presents a programme focussing on one particular Baltic country. This year the focus is on Sweden, with music from Berwald to Sandström, from Baroque to Contemporary. Over 40 events are planned with performers including Kristjan Jarvi and his Baltic Sea Philharmonic, the NDR Elbphilharmonic Orchestra & Thomas Hengelbrock, Ann Hallenberg, Gidon Kremer, Jan Lisiecki and many more. The island has many historical links to Sweden, and the many links between Sweden, Germany and the region of Western Pomerania (where Usedom is situated), will be explored throughout the festival. The Swedish connection dates back to the 30 Years War, when in 1630, King Gustavus Adolphus of Sweden landed on the island, and it remained annexed to Sweden until 1720 when it was sold to the Prussian King Frederick William I. In 1740 Frederick the Great of Prussia developed a seaport in Swinemünde (now Świnoujście in Poland). The small village of Peenemünde came to prominence again during World War II, as the Luftwaffe tested missiles and rockets, including the V-1 and V-2 nearby. The Peenemünde Concerts, at the former WWII military testing site, will host Baltic Sea Philharmonic and Kristjan Järvi with violinist Gidon Kremer and his Kremerata Baltica. Kremer will perform the violin concerto by Mieczyslaw Weinberg, the Polish composer of Jewish origin and the concert marks the the 25th anniversary of the signing of the German-Polish Neighbour-Treaty. 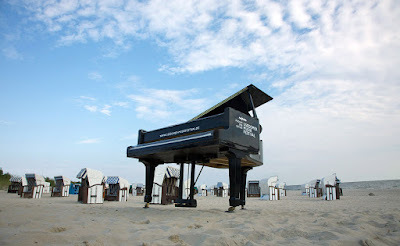 The concerts give the audience the opportunity to explore places like the seaside resort of Ahlbeck, including one of Europe's longest sandy beaches. And the island is known as the sunniest region in both Germany and Poland! Full information from the Usedom Music Festival website.